Every graduate from the University of Louisiana at Lafayette has their name inscribed on a brick, which is placed on the Walk of Honor. Our alumni are a part of the University, and the Walk of Honor is our way of congratulating and thanking them. 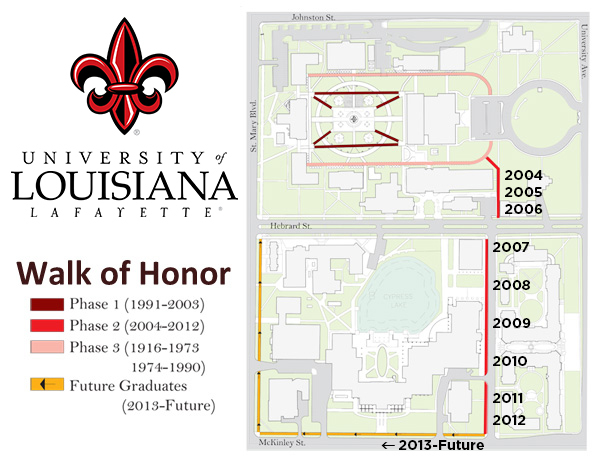 The Walk of Honor begins near Martin Hall, snaking through and around the Quad, across Hebrard Boulevard, up Boucher Street and continuing down McKinley Street. The bricks are arranged alphabetically by year. All graduates through 2014 have a brick on the Walk of Honor, and we're working to add the bricks for each new graduating class as campus improvements continue. The next time you return to campus, find your brick and take a photo! Post your UL Lafayette photos with the hashtag #ulalumni. Bricks for the alumni who graduated between 1903–2003 are located in the Quad and surrounding covered walkways.